OPPO’s sub-brand Reno has finally debuted in the market with its two new smartphones. The launch event has taken place in China today where it has unveiled the flagship Reno 10x Zoom Edition smartphone along with a standard mid-range Reno model. The former was first introduced in Mobile World Congress in Barcelona this year. It comes with the 10x lossless zoom technology that can provide a focal length from 16mm to 160mm and as per the company’s claim, it can click images with great sharpness and details placed far away from the subjects. The OPPO Reno 10x Zoom Edition comes with a bezel-less 6.65-inch AMOLED display having the support of FHD+ resolution. The screen is protected with a Gorilla Glass v6 and the fingerprint sensor is placed under the screen. The device is based on a Qualcomm Snapdragon 855 SOC, which is paired with up to 8GB of RAM and 256GB internal storage. In terms of optics, the model sports a triple lens setup at its rear. The setup includes a 48MP primary sensor (Sony IMX586), an 8MP 120-degree ultra wide-angle lens and a 13MP telephoto lens. At the front, there is a 16MP selfie pop-up camera, which is named as Shark Fin pop-up module. The smartphone runs on ColorOS 6 based Android v9.0 (Pie). A 4,065mAh battery is provided as its powerhouse and it also gets the VOOC 3.0 fast charging support. The other one, the standard Reno flaunts a smaller 6.4-inch OLED display that also comes with Gorilla Glass v6 protection. A 16MP wedge-shaped selfie shooter can be found on the display to maximise its screen space. The handset is based on the Snapdragon 710 chipset, which is paired with up to 8GB RAM and 256GB storage. At its rear, there is a dual camera setup that includes a 48MP primary lens and a 5MP sensor. Apart from this, it has a 3,765mAh battery and VOOC 3.0 fast charging technology. Besides the specifications, the pricing is also revealed for the two smartphones. 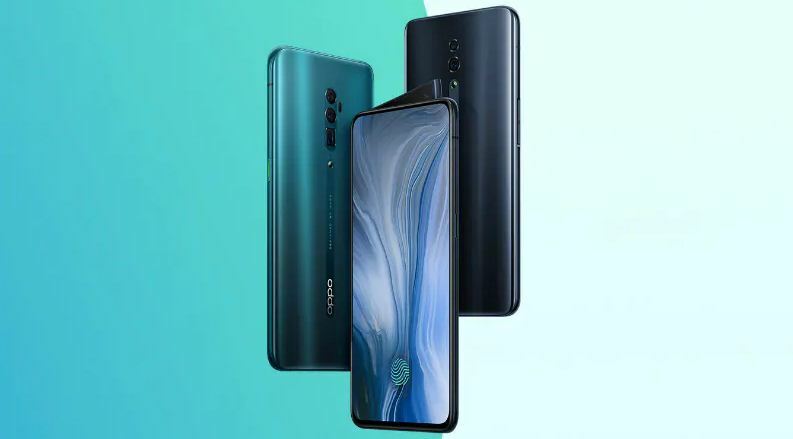 As for now, the flagship model Reno 10x Zoom Edition will be available in a total of three variants in terms of its configuration. The base variant with 6GB RAM and 128GB internal memory has a price tag of RMB 3,999 (around Rs 41,000). The other models with 6GB RAM/256GB storage and 8GB RAM/256GB storage are priced at RMB 4,499 (approx. Rs 46,000) and RMB 4,799 (approx. Rs 51,000), respectively. All the variants can be availed from mid-May. The company has also stated that a 5G edition of this smartphone will arrive in the near future. As the flagship model, the mid-range Reno is also available in three configuration variants. The 6GB RAM and 128GB storage variant is priced at RMB 2,999 (around Rs 30,000) and the 6GB RAM with 256GB internal memory variant has a price tag of RMB 3,299 (approx Rs 34,000). The range-topping 8GB RAM/256GB storage option has been priced at RMB 3,599 (approx. Rs 37,000). In China, the handset will go on sale from April 19th and buyers can choose between four colour options – Extreme Night Black, Fog Sea Green, Mist Powder and Nebula Purple. Realme 3 Pro Official Launch date set for 22nd April.